A Bigger World Foundation provides funding and support so that small groups of students can have unique experiences that connect to a topic they are passionate about. We have explored the culinary world, fashion, science, engineering, the great outdoors, tours of Chicago, and more! A Bigger World Foundation (ABW) was founded in 2012 by Megan and Matt Schrecengost. They were inspired by their love of travel and new experiences and realized that these powerful opportunities have the potential to change lives, especially for young people. At the same time, Megan and Matt recognized that far too few young people had the opportunity to explore the world outside of the classroom. Together, they created ABW to do their small part to empower students, and the educators, who work with them every day to explore the world, broaden their horizons, and realize their dreams. ABW’s first Executive Director, Lisa Nigro, worked to establish partnerships with educators, youth mentors, and organizations that would help ABW further it’s impact. Today, A Bigger World Foundation focuses on partnerships with educators, after- and out-of school programs, and community groups. We strive to empower students by expanding their capacity to imagine their world outside of school, increasing the students' understanding of their own potential through custom and otherwise unavailable experiences. 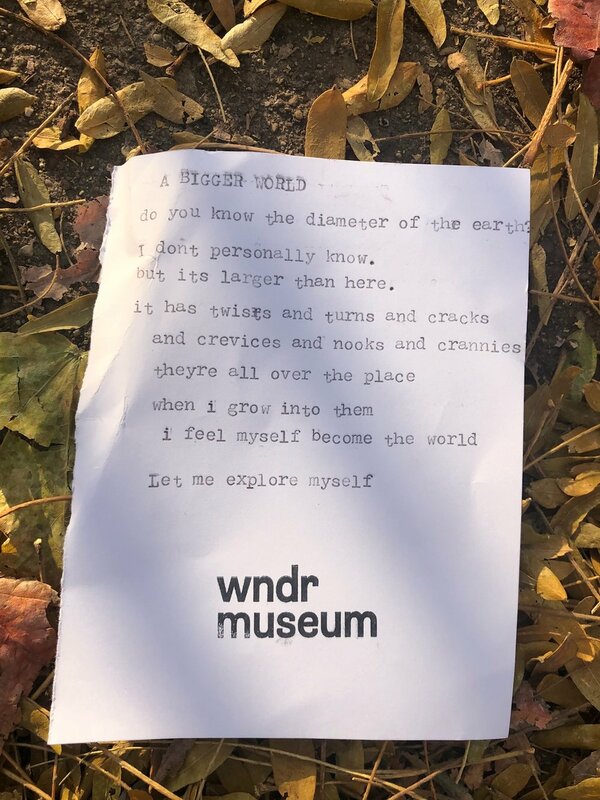 Custom Poem created at WNDR Museum.